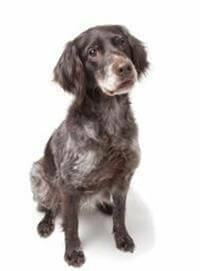 The large Munsterlander is a black and white variety of the German Longhaired Pointer. Its ancestors can be traced back to the 9th Century. The large Munsterlander was introduced to Australia and recognised by the Australian National Kennel Council in 1983. The Average lifespan of a large Munsterlander is 12 to 14 years. This is an affectionate and energetic breed. Perfect for active individuals or families. They are very loyal and like nothing better than to be with their owners as much as possible. Though they may be left alone at times, they are not a breed to be shut away for long periods. They are a naturally clean dog and not destructive, especially if raised with plenty of toys or objects of their own. They are slow to mature and the males often require firmer handling than females. They respond very well to positive training, praising being rich reward for doing your bidding. A highly intelligent breed, they can predict your actions, often reminding you of the time, especially dinnertime. The large Munsterlander was primarily bred as a multi-purpose gundog, and maintains a strong hunting instinct. The Large Munsterlander's coat is very low maintenance. It has a medium length coat that lies close to its body, with slightly longer coat on its legs, underside and tail. Their coat is very easy to keep clean, as the dirt drops out when dry. They do require occasional brushing as the longer coat can mat if left unattended. It is important to remember that this breed is very energetic and while they can be kept in small back yards they do require regular exercise. The large Munsterlander makes an excellent companion. They are especially suited to active individuals and families. They are especially good with children.